21 DAYS TO A HAPPIER FAMILY draws on positive psychology to gives parents ways to make their family happier than ever, starting today! Everyone wants their family to be happy, but so much gets in the way - work stress, commitments and our children's challenging behaviour are some of the usual suspects. Less obvious obstacles are our own habits and expectations, a reactive parenting style, and even a lack of clarity about what makes a family truly happy. As a result, families often seem fragmented, stressed and out of control. 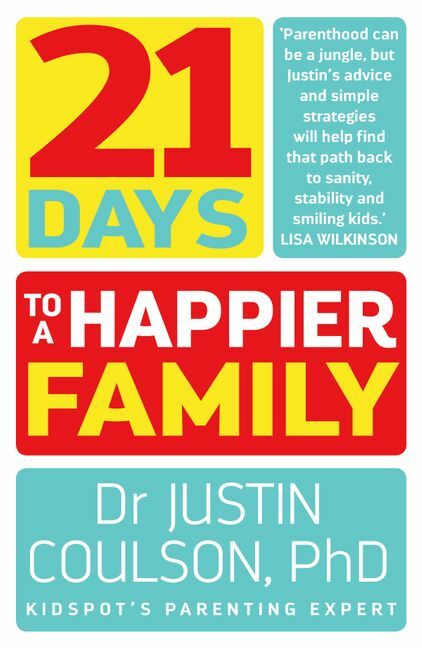 Kidspot parenting expert Justin Coulson knows how to make families happier. In this book, he combines cutting-edge insights from positive psychology with classic psychological research to help parents identify and develop habits that will strengthen their family. In his trademark warm and empathic style Justin covers topics like finding the most effective parenting style for your child, getting relationships right and how that leads to effective discipline, using mindfulness in parenting, being emotionally available to your children - and so much more.